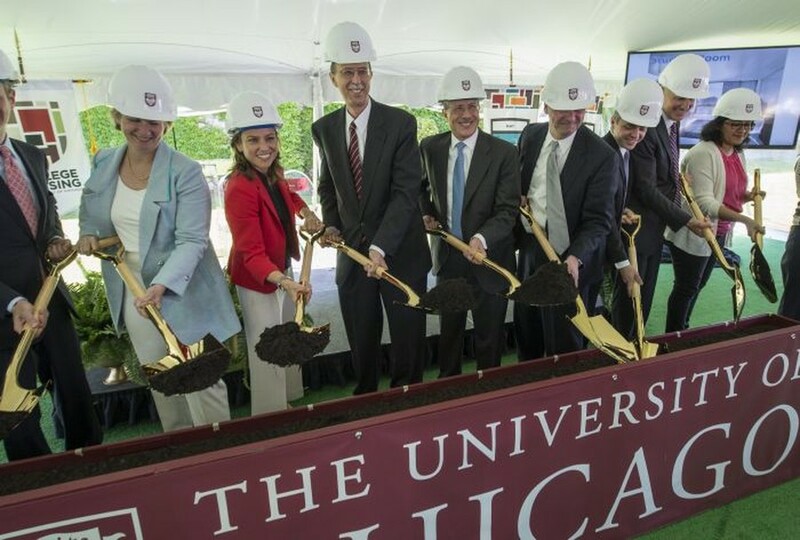 The University broke ground on Campus North Friday morning, officially beginning construction on the site of the new residence hall and dining commons. Campus North, set to house approximately 800 students, will open September 2016. The groundbreaking, which took place on North Field behind Henry Crown,was attended by approximately 150 administrators, staff, students, and alumni. Campus North and Dining Commons was designed by Studio Gang architects, headed by Jeanne Gang. It is composed of three buildings—fifteen, eleven, and five stories tall—organized into eight College houses. Each house is designed around a three-story “house hub,”or acentral lounge, and doubles, singles, and apartments radiate out on each side from the hub. The building will also include classrooms and retail space, among other amenities. According to the original press release, the dorm was designed to both connect campus to the north Hyde Park community and provide a more independent living experience for third- and fourth-years. “It really opens up this part of the campus to the community and invites people in, so we couldn’t be more excited about it,”said Chairmen of the Board of Trustees Andrew Alper at the event. Campus North was also designed with special accommodations for third- and fourth-years. The College currently houses slightly over 50 percent of students in residential housing, but aims to increase that percentage to at least 70 percent, more in line with that of peer institutions. “I’ll bet you that the day [Campus North] opens we’re gonna have third- and fourth-year kids lined up around the block there because the quality of the housing; those apartments are going to be spectacular,”John W. Boyer, dean of the College, said in an interview with the Maroon this February. Boyer was one of several speakers at the groundbreaking and also said that he hoped that Campus North was just the beginning of the University’s dorm construction. “I hope profoundly [Campus North] and its sister halls near Regenstein and South Campus will soon be joined by other new residential facilities as well as we work towards our goal of an ever more strongly residential campus, truly supportive of all the students in our college,”Boyer said. Alumni at the event expressed enthusiasm for the new dorm. Mark Brickell (A.B. ’74) and Anita Brickell (A.B. ’75, M.B.A. ’76), who met in Pierce Tower in 1971 and whose daughter Missye Brickell(A.B. ’06) lived in Pierce Tower as an undergraduate as well, both appreciated the model of the new residence hall. “The design looks terrific, I like the way that the number of rooms has been split between the three buildings, its not just one long, large tower or two large towers. I like the design and there’s still some green space that goes with it,”Anita Brickell said. The event was also attended by a local community group Save 53rd Street, protesting the University’s construction of Vue 53, a 13-story retail and residential building at 1330 East 53rd Street. The group is currently appealing a decision that dismissed a lawsuit against the University. Several protesters held signs and gave out leaflets at the reception after the groundbreaking. Some construction has already begun on Campus North, and will intensify now so that it can open in just over two years. “I like groundbreakings but I love ribbon cuttings, and I look forward to being back here in two years to cut the ribbon,”Alper said.